Last night saw the first official Cinematic Celebration at Universal Orlando Resort. Although the show has been in technical rehearsals since the beginning of the month, the official debut was Monday evening. Fortunately, the biggest difference between the show in rehearsal and the official opening is the opening narration. An excellent touch! Replacing the previous version of this show, the new iteration focusses on intellectual properties that have a presence in the parks versus a tribute to Universal Pictures’ cinematic legacy. In terms of the show technology, water fountains, and special/pyro effects, the new show is a major win! 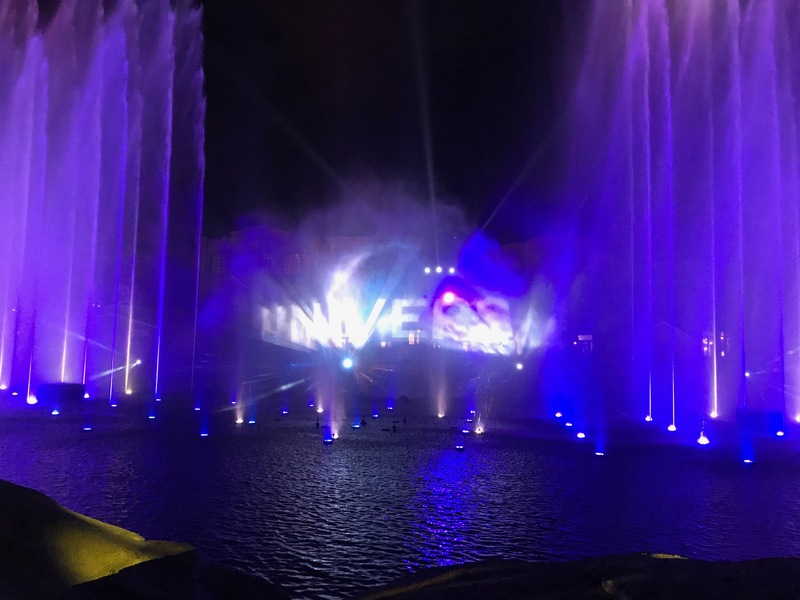 From the moment the show begins with an excellent narration setting the context for the show to the breathtaking dancing fountains, you will be awestruck by the sheer spectacle of it all! The combination of water, pyro, laser, and projection effects is outstanding. It truly feels like a cinematic experience! There is something for everyone in this show. My favorite parts were Jurassic World and E.T. the Extraterrestrial. You’ll also find clips and scenes from Trolls, Transformers (which includes scenes from the attraction), Fast and Furious, Despicable Me, Harry Potter, How to Train Your Dragon, Sing, Secret Life of Pets, and Kung Fu Panda. In addition to the water screen projections, the buildings on the opposite side of the lagoon are also integrated into the show. Incredibly immersive. My sister was impressed! Which was important to me because we have been going to Universal since the early 90s, and like to experience new attractions and shows together whenever possible. She lives out of state, so we try to time it just right when new offerings open! Helps to create lasting #UniversalMoments. Beginning with last year’s Magic of Hogwarts Castle show, Universal Orlando has been stepping up its game in the nighttime spectacular competition amongst Florida theme parks. For years, it has largely been thought, and accurately so, that Disney World was the king of nighttime shows. With the introduction of the Hogwarts Castle show and the new Cinematic Celebration, Universal shows that it is a formidable opponent in the arena of nighttime shows. Not only is the show impressive from a technological perspective, the music is fantastic and the combination of water screens, projections, and pyrotechnics is top notch. You will certainly be wowed by the dazzling array of lights, movie clips, water effects, and more. Whereas the previous nighttime show had some water effects (and of course the water screens), this show makes the famous one in front of the Bellagio in Las Vegas look like something you put together in your back yard. The water fountains beautifully dance along with the music and accompanying images from the film selections. Whereas some shows with many fantastical effects and elements can feel like many separate parts thrown together in a tossed salad, so to speak, this show seamlessly blends all the elements together to generate one show, one experience. The manner in which the show is designed allows for Universal Orlando to update it with different films as the interests of the park guests change. Of all that this show has going for it–and it IS a great show–I cannot help but wonder why Universal fails to include any mention of its history, the fact that it essentially birthed the American horror film, and other iconic properties of the entertainment giant. Obviously, the goal was to connect the show to the in-park IPs, but the show like it was nearly all spectacle and little narrative to speak of. Thankfully, the narration at the beginning does help to add context, but the experience of watching the show leaves me wanting more. Leaves me wanting more, in that I was looking for something with more emotion behind it. In my opinion, she shows lacks a strong ability to make an emotional connection with the audience. This is often the result of a themed attraction or show that focuses so much on the spectacle of the show, that it falls short of containing a strong narrative. One of my favorite quotes is, “the greatest art is the art of storytelling” (C.B. DeMille); but unfortunately, the new Cinematic Spectacular does not live up to the art of storytelling, but instead concentrates on the spectacle of show. Although I have highlighted some elements of the show that I am disappointed in, don’t get me wrong, it is a fun show that is well-worth the time to find a great place from which to watch. You should definitely make the time to see the show during your visit to Universal Orlando. The best place to view the show is from the Central Park area of Universal Studios. I watched it from the waterside behind the big boulders. Presently, the show begins at 9:45 in the evening and guests begin to select viewing locations about 30-45mins before showtime. As the show just officially began, you may want to allow for an hour to find a great spot from which to watch the show. Definitely a show that you don’t want to miss. For some highlights from the show, please see our video!